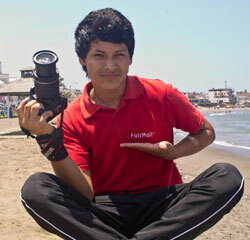 A great example of a teenager who is working well towards his goals is 17-year-old Kzanier from FairMail Peru. In September 2017 he started his second semester at the private ITN institute in Trujillo where he is studying a 3-year career in graphic design. With the Apple laptop he just bought from his FairMail money he is already better equipped than FairMail’s inhouse designer! Kzanier started studying at the ITN in March 2017. It is regarded as one of the best private institutes in Northern Peru to study graphic design, with experienced teachers and up-to-date equipment. Combining his new studies with his classes at FairMail and his part-time job in a shoe shop, the first months weren’t easy for Kzanier. “What hit me most in the beginning was getting my schedule organised as I was also working. I also had to get up really early but now I am used to that” he explains. Kzanier is working very focussed on his future, taking one step at a time. He has it all worked out. With his FairMail earnings he already bought his own DSLR camera and is now saving up to buy different lenses he needs for his future work. He hopes to be able to combine working as a graphic designer with doing professional photography. He already did his first paid wedding photo shoot! 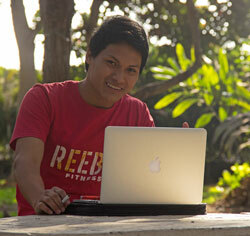 With the MacBook he bought from his FairMail money he can edit his pictures and turn them into great looking designs. That way he hopes to have everything set up to earn a living. And pay for his marketing and international business study he hopes to continue after finishing at the ITN. Have a look at Kzanier’s cards here to see if you can give him a helping hand to get there. One step at a time.